My father is the ultimate plaque reader. As a child, we marked road trips not by miles but by plaques read. Those "off road" historical markers? The ones that you saw beat-up, kid-smeared green station wagons turning out for? The ones that you happily disregarded ? Yeah. We read 'em. No wonder then, that on Father's Day this year, I felt compelled to read a plaque. It was early evening outside the FM Smith Recreation Center in Oakland. I was the first to arrive for our Neighborhood Crime Prevention Council Meeting. Milling about the rec center was a handful of youth, in the distance the thump of a basketball and squeak of sneakers. Marijuana smoke wafted. Five minutes passed but none in my group had arrived yet and the center was still locked. I scanned the park trying to find the source of the smoke then noticed in the distance four life- sized mules covered in graffiti. Next to them, an equally graffiti-decorated plaque. I reluctantly made the trek. Turns out that the FM Smith Rec Center is named after Francis Marion Smith, known internationally as "Borax" Smith. Born in Wisconsin in 1846, went to Nevada at the age of 21 to make his fortunes. While there, he discovered and staked a claim for a borax mine. 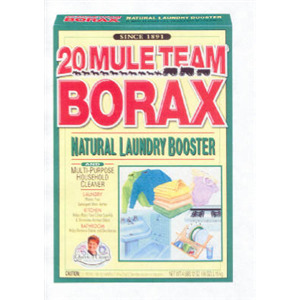 Built an empire on this natural mineral and marketed it as 20-Mule Team Borax because it took 20 mules to haul the mineral from the mines. Later, settled in Oakland with his wife and did wonderful things like build housing for orphaned girls and develop rail systems in the area. Died, donated this part of his estate to the City as a park. Automatic Diswasher Detergent: equal parts borax and baking soda, 2 tablespoons per load. All-purpose Cleaner: 2 tbsp vinegar, 1 tsp borax, 2 cupts hot water, 1/4 cup liquid soap. It was early evening. The city about me hummed, squaked and squealed. As a person who moved to California from the midwest when I was 21, as a seller of minerals, a lover of natural cleansers, an Oakland resident involved in making my city a better place. I felt the rush of a connection to another time and place. I used to think plaques were dorky. Now, I just wish I live long enough and do well enough in my life to have a plaque of my own. Graffiti covered or not. Thanks darling. You words of encouragement came at just the right time for me in my life. So whatever I've done for you, you've done for me.